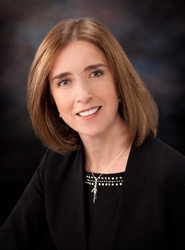 Lorna Richmond is currently Exploration Manager for ConocoPhillips Alaska. Richmond joined Conoco (U.K.) in Aberdeen in 1997. With 20 years of experience with the company, Richmond has held a variety of subsurface technical and leadership roles in Aberdeen (North Sea Development, Exploration and Operations), Houston (Subsurface Technology - Gulf of Mexico and Venezuela, Exploration & Appraisal), Stavanger (New Ventures Exploration), Calgary (Beaufort Sea Exploration Supervisor), Houston (Global New Ventures Exploration Manager - Europe, Middle East, Canada, West Africa and Latin America) and Anchorage (Greater Kuparuk Geoscience Manager and Rotary Development Manager). Richmond assumed her current position as Exploration Manager for Alaska in 2017. Born in the East Riding of Yorkshire, England, Richmond holds a Bachelor of Science in Geology from the University of Durham and a Doctor of Philosophy in Geology from the University of Aberdeen.